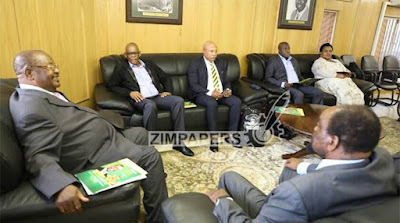 A delegation from South Africa’s Africa National Congress (ANC) arrived last night in the country to meet with the ruling Zanu-PF party officials on a solidarity visit. The team which is being led by ANC secretary general Cde Ace Magashule was this morning briefed on the current situation in the country by the ruling party secretary for administration Cde Orbert Mpofu at Zanu PF Headquarters. Other senior ANC officials who arrived in the country are, Cde Tony Yengeni, Cde Thoko Didiza, Cde Bongani Nongo, who are all ANC central committee members and Cde Justice Phitso, the chief of staff to the secretary general’s office. In his address, Cde Magashule applauded President Mnangagwa for giving them the opportunity to interact with their counterparts. “We clearly understand the situation on the ground which is affecting your country and we want to move forward as former liberation movements in addressing your situation,” he said. “Our long walk to freedom as stated by your founding father Cde Nelson Rolihlala Mandela still continues. As Zimbabwe we have achieved one milestone in this journey of emancipation by ensuring that we take ownership of the land.